Netgear is rolling out new security features to its Arlo line of smart home cameras... for a price. The features come wrapped in new service plans that give customers the option of upping the security game of devices like the Arlo Pro 2, Arlo Go and Arlo Q. The new plans also promise to reduce the number of false notifications users receive from their cameras. Chief among the new features is Person Detection and Cloud Activity Zones. The latter lets customers mark off areas they don't want to get alerts for, such as trees swaying in the wind. Pesky trees. Person Detection helps Arlos to filter out what's a person and what's a, say, cat running across the camera's path. Another new feature, Rich Notifications, lets users tap directly into the Arlo feed from their phone's lock screen, eliminating the need to open the app and watch videos from alerts that are coming into their smartphone. The above features are all standard in the $2.99-per-camera-per-month Arlo Smart Plan, but if you bump up to the Arlo Smart Premier or Arlo Smart Elite plan, your cameras gain the ability to contact local first responders via an e911 Emergency Call Service. 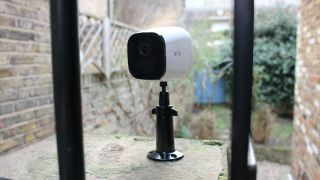 The Arlo Smart Premier plan price is $9.99 per month for up to 10 cameras, while the Smart Elite plan is $14.99 per month for up to 20 cameras. The plans offer extended cloud storage of recordings of 30 days and 60 days, respectively. The new service plans come just a few days after Netgear issued a warning to Arlo customers to change their passwords after suspicious activity was spotted around user accounts. While Netgear's systems weren't breached, it appears as though attackers may have obtained credentials from a third party. Security for your car: check out the best dash cams!